Is It Time To Buy South Africa For A Trade? South Africa ETF To Rally 25%? With global equity markets looking poised for a tactical bounce in the week(s) ahead, one market in particular looks ripe for a potential squeeze higher. 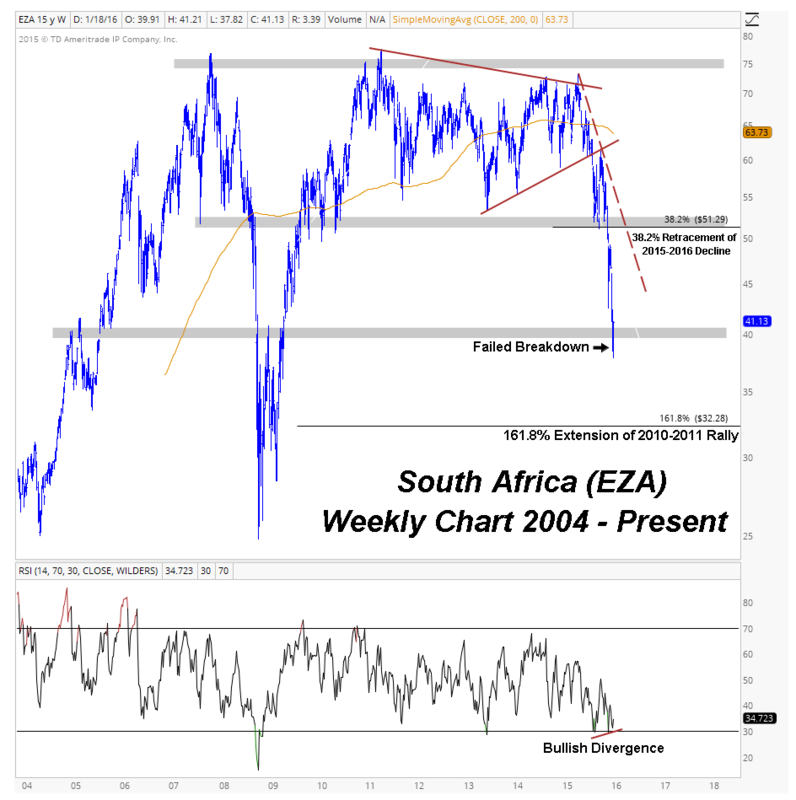 South Africa has been in a strong downtrend since breaking down from a symmetrical triangle late last August. Selling quickly accelerated after a major support level near 51-52 broke shortly after the breakdown from, and retest of, the symmetrical triangle. Last week prices traded through another major support level near 40 and swiftly reversed to close the week back above it while momentum diverged positively. Although the main structural downside target lies near 32, current conditions suggest a counter-trend rally may be in the cards. As long as this failed breakdown holds, prices look like they could retest the broken support level near 51, which also corresponds with the 38.2% retracement of the 2015-2016 decline and the downtrend line from the 2015 highs. Time To Fade The Natural Gas Rally? With Natural Gas futures up roughly 48% since the December lows, the urge to call a bottom in this asset class is quite strong. However, history tells us that the most vicious rallies occur during bear markets, which may suggest that current levels offer a decent risk/reward on the short side. Before taking a look at price, it’s important to be aware of current sentiment and seasonality data within its proper historical context. In terms of sentiment, the recent rally has allowed a number of things to occur. Commercial hedger net long positions are slowly backing off all-time highs. Public sentiment moved from multi-year levels of pessimism to the a more neutral reading and the most optimistic since late 2014. Momentum as measured by a 14 period RSI across multiple time frames has reset from deeply oversold to a more neutral reading. In addition to that, seasonality data from the past thirty years suggests that Natural Gas tends to struggle in the early months of the year, with average returns of -5.7% and -0.2% in January and February, respectively. There was no doubt that sentiment was stretched to extreme levels late last year, but the recent rally allowed sentiment and momentum to come back toward more neutral territory; possibly setting up for another leg lower. 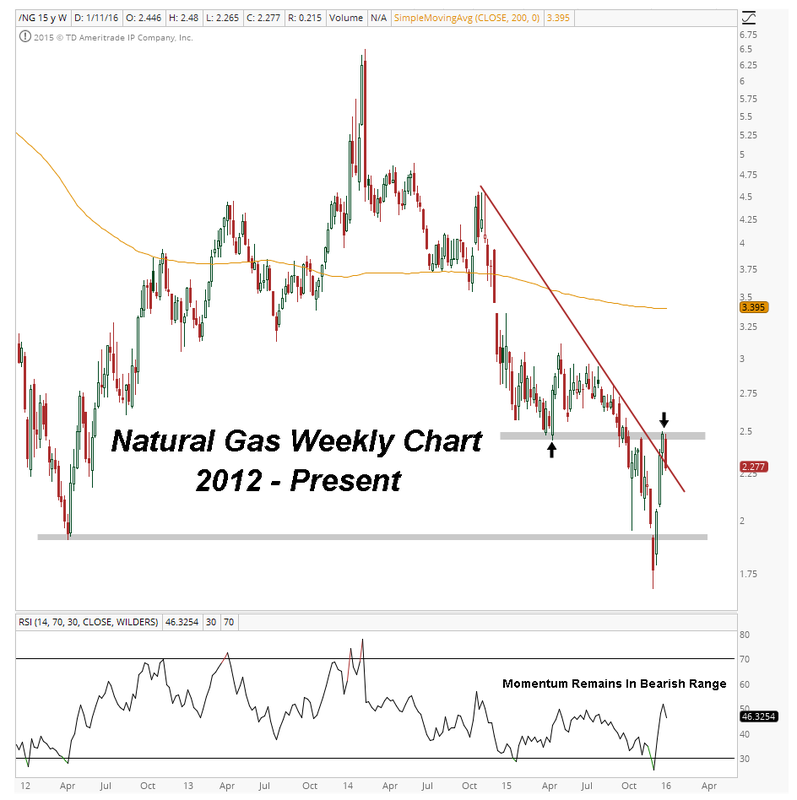 In terms of price, structurally Natural Gas remains in a downtrend. After a failed breakdown below the 2012 lows sparked a vicious rally December into January, prices are back at overhead supply and potentially putting in a failed breakout above the downtrend line from the late 2014 highs. Momentum did not put in a bullish divergence at the recent lows and remains in a bearish range. Shares of Twitter (TWTR) broke the $20 level on the downside and declined as low as 19.60 before recovering some of the day’s losses. The move brought TWTR stock to new 52 week lows and continues its recent slide. Below is an updated stock chart for Twitter (TWTR) as well as a few bullet points based on what I’m seeing across time-frames. Currently the TWTR stock decline is taking a pause at the 161.8% Fibonacci extension of the October 2015 rally. The stock is oversold but this appears to be short-term. Either way, it may lend a hand to a bounce. On a macro level, Twitter stock price remains in a downtrend and below the 200 period moving average on all the major time-frames. The structural target on the weekly chart remains $13.15 based on the 161.8% Fibonacci extension of the April – July 2014 rally (not pictured). As of now, momentum remains in a bearish range and a lacks any signs of a positive divergence on the weekly, daily, or 65 minute charts. The stock could bounce in the very short-term, but there is not any evidence to suggest a longer-term bottom is near. Overall the weight of evidence continues to suggest fading strength toward resistance near $22.00 and 23.50, as shown by arrows on the daily TWTR stock chart. For a full disclaimer, click here. This post originally appeared on SeeItMarket.com on 01/08/2016. With every global equity market down to start 2016 and media outlets declaring “Markets In Turmoil”, it can seem like there are no opportunities to make money in this environment. While it may be true that it’s difficult to press shorts while stocks are extended in the short-term, and even more difficult to try to make money on the long side until global markets stabilize for a few days, as market participants we can look at all liquid asset classes around the globe for opportunity. With that being said, Live Cattle Futures are a non-correlated asset that look interesting on the short side. 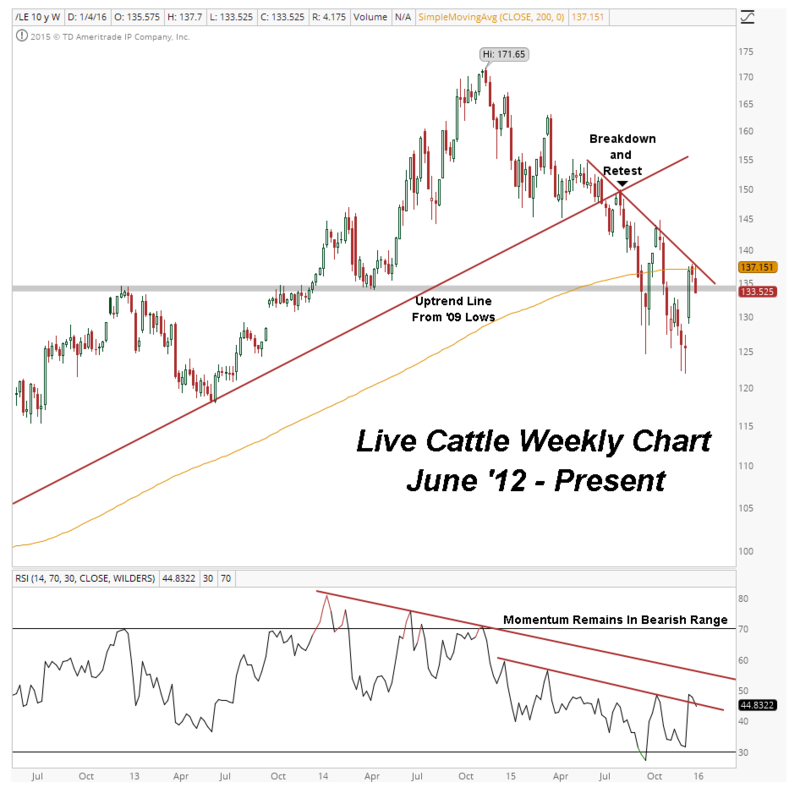 From an structural perspective, Live Cattle Futures broke their uptrend line from the 2009 lows in July, retested that level in August, and have been falling ever since. This market became extended to the downside in the short-term late last year and experienced some mean reversion, but have since run into the downtrend line from the June lows, as well as prior support / resistance from the 2012 highs and 2014 lows. With momentum in a bearish range and the 200 week moving average beginning to roll over, the weight of evidence continues to suggest this is a market we want to be fading on strength.